Explore the memoirs of one of the most inventive Americans in history. A fascinating and unconventionally educated man, Benjamin Franklin imparts—in his own words—wisdom and remarkable life lessons on the art of living with great personal integrity. Taken from John Bigelow’s carefully researched 1868 publication that was transcribed directly from the original manuscript, this copy is sure to be a treasured part of any home library. 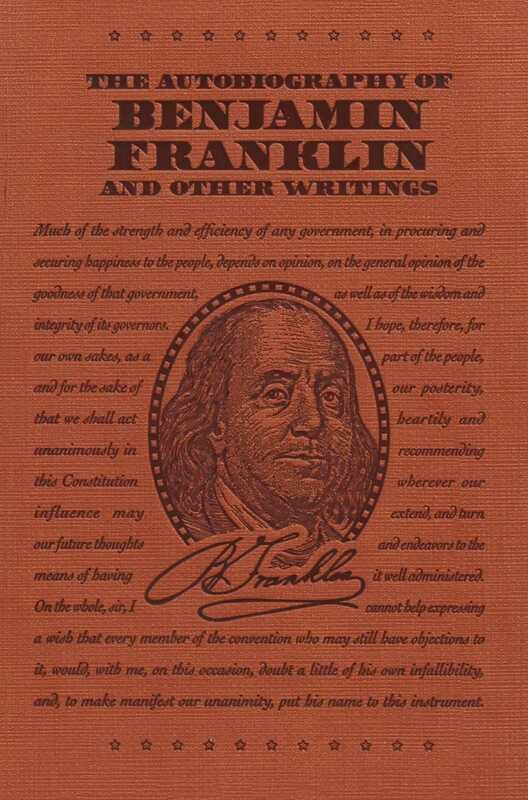 Franklin’s autobiography and significant papers are still in great demand globally, and describe the interesting, varied, and unusual life of one of the most amazing Founding Fathers of the United States. Benjamin Franklin is one of the most celebrated Founding Fathers of the United States. Born in Boston in 1706, he later moved to Philadelphia, where he rose to prominence as a printer, writer, inventor, scientist, entrepreneur, and statesman. He is best known for helping to draft both the Declaration of Independence and the Constitution of the United States; his other accomplishments include negotiating the 1783 Treaty of Paris, which ended the Revolutionary War; publishing Poor Richard’s Almanack; and creating the first American lending library. He died in 1790, though his wit and wisdom—along with many of his inventions, such as bifocals and the Franklin stove—survive to this day. Elmer Boyd Smith (1860–1943) was a Canadian and American illustrator.